GLENDALE, Ariz. — Jake Oldroyd can’t be considered an unknown around Provo anymore. 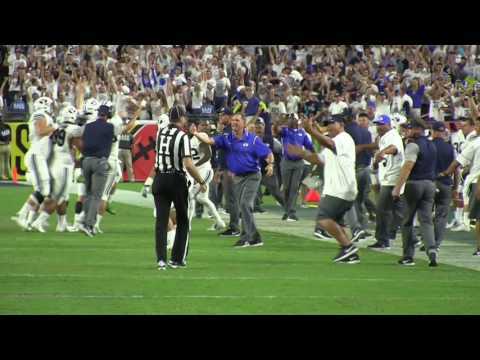 Rarely does a special teamer launch himself into folklore so quickly, but that was the case Saturday night when Oldroyd hit the game-winning 33-yard field goal for BYU against Arizona in the Cougars' 18-16 victory. He's a true freshman who, according to his Twitter profile, announced Feb. 20 he would attend BYU and forgo preferred walk-on offers at Utah State and North Texas. Not even four months ago, Oldroyd was still in high school, going to prom. Less than a month ago, he injured himself as BYU fall camp opened and required knee surgery, returning to the team when classes started. And Oldroyd will be a missionary soon enough, telling Greg Wrubell, BYU's play-by-play announcer, after the game that he will be submitting his LDS mission papers on Sunday. Oldroyd said his LDS mission papers will be submitted tomorrow; plans to leave for two years at the end of December. And one thing was for certain Saturday night, just before midnight Mountain time. This 6-foot-1, 170-pound freshman from Carroll High in Southlake, Texas, has the backing of his teammates and coaches. "Our special teams coordinator, assistant head coach, Ed Lamb, felt really comfortable with him. Especially after the field goal and PAT we had earlier," BYU head coach Kalani Sitake said. Earlier in the game, Rhett Almond, listed as the starting kicker, made a 24-yard field goal that barely crossed over the bar. Almond then missed his first extra-point attempt of his BYU career. With the missed extra point and a failed two-point conversion later, the Cougars trailed 16-15 after a Nick Wilson 49-yard run with 1:26 remaining. Questions were rampant about BYU's shaky kicking situation. But not on the Cougars' sideline. After driving 53 yards in eight plays, the Cougars set Oldroyd up with the 33-yard attempt with eight seconds remaining. "Probably not a good time to do it, but Ed felt comfortable with Jake being in that position. We had practiced it quite a bit. I had to lean on him as the special teams coordinator to make that decision, and I was OK with it and it worked out," Sitake said. Oldroyd has a mentor in BYU senior punter Jonny Linehan, the leader among the kickers. "(He's) a really phenomenal kicker and someone I've tried to take under my wing and look after. He's going to be great," Linehan said last week, as uncertainty loomed over who would replace Trevor Samson as BYU's placekicker. He has the trust of his other teammates, too. “You know you gotta have faith in your teammates. And honestly you just got to stay positive no matter what and you gotta believe in your teammates," said senior running back Jamaal Williams, who rushed for 162 yards on the night. "I have no doubt that everyone on that sideline was believing for (him) to make that field goal. And it was great to see him coming off smiling and it’s just great for him to have that type of accomplishment." Those teammates set up Oldroyd with the chance to succeed. BYU took over at its own 31-yard line with 1:20 to play and two timeouts remaining after Wilson's touchdown. The first two plays, both passes, netted the Cougars 20 yards. After an incompletion, senior quarterback Taysom Hill hit junior wide receiver Jonah Trinnaman for an 11-yard gain. Even with the clock running down, BYU ran the ball on the next four plays, the last being a Williams run up the middle for 4 yards that set Oldroyd up with a straight shot. That BYU chose to set up the field goal attempt instead of taking a shot at the end zone showed the confidence coaches and players had in the young kicker. After an Arizona timeout to try to ice the new kicker, Oldroyd repaid that confidence by calmly kicking the game-winner between the goal posts. What will Oldroyd do for a second act in his young college career? Whatever it is, he'll do so with a newfound popularity. His followers on Twitter vaulted over 2,000 overnight.